Download "MATH 1304 H COLLEGE ALGEBRA"
1 WAYLAND BAPTIST UNIVERSITY HAWAII CAMPUS SCHOOL OF MATHEMATICS AND SCIENCES Mission Statement Wayland Baptist University exists to educate students in an academically challenging, learning-focused and distinctively Christian environment for professional success and service to God and humankind. 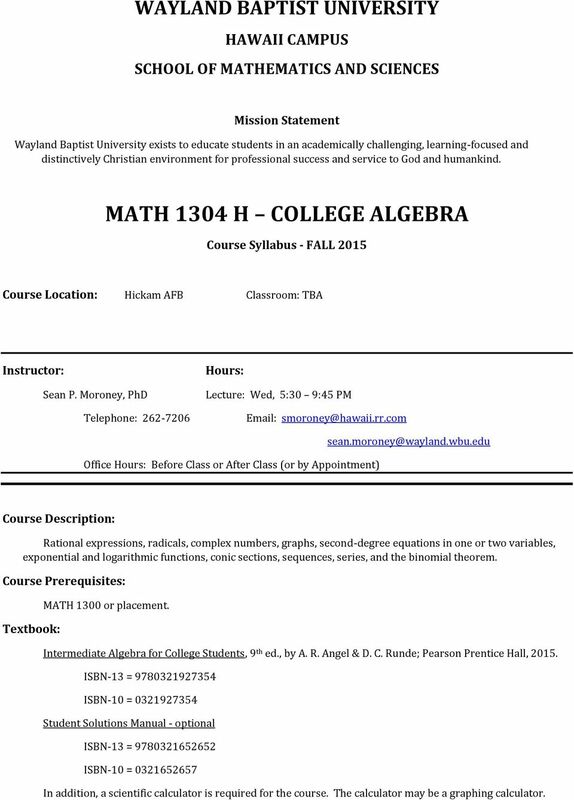 MATH 1304 H COLLEGE ALGEBRA Course Syllabus - FALL 2015 Course Location: Hickam AFB Classroom: TBA Instructor: Sean P. Moroney, PhD Telephone: Hours: Lecture: Wed, 5:30 9:45 PM Office Hours: Before Class or After Class (or by Appointment) Course Description: Rational expressions, radicals, complex numbers, graphs, second-degree equations in one or two variables, exponential and logarithmic functions, conic sections, sequences, series, and the binomial theorem. Course Prerequisites: Textbook: MATH 1300 or placement. Intermediate Algebra for College Students, 9 th ed., by A. R. Angel & D. C. Runde; Pearson Prentice Hall, ISBN-13 = ISBN-10 = Student Solutions Manual - optional ISBN-13 = ISBN-10 = In addition, a scientific calculator is required for the course. The calculator may be a graphing calculator. 4 4 Examinations must be taken at the times they are scheduled. Tests or quizzes missed for a legitimate reason can only be made up by special arrangement with the instructor and should be made up before the following class. It is the student s responsibility to contact the instructor and to arrange for a make-up assessment. Evaluation and Grading: Grades will be awarded on the following basis: Grade Percentage Range Range of Scores Grades will not be rounded up. Grading Criteria: A 90% - 100% B 80% % C 65% % D 50% % F Below 50% Below 1250 Students shall have protection through orderly procedures against prejudices or capricious academic evaluation. A student who believes that he or she has not been held to realistic academic standards, just evaluation procedures, or appropriate grading, may appeal the final grade given in the course by using the student grade appeal process described in the Academic Catalog. Appeals may not be made for advanced placement examinations or course bypass examinations. Appeals are limited to the final course grade, which may be upheld, raised, or lowered at any stage of the appeal process. 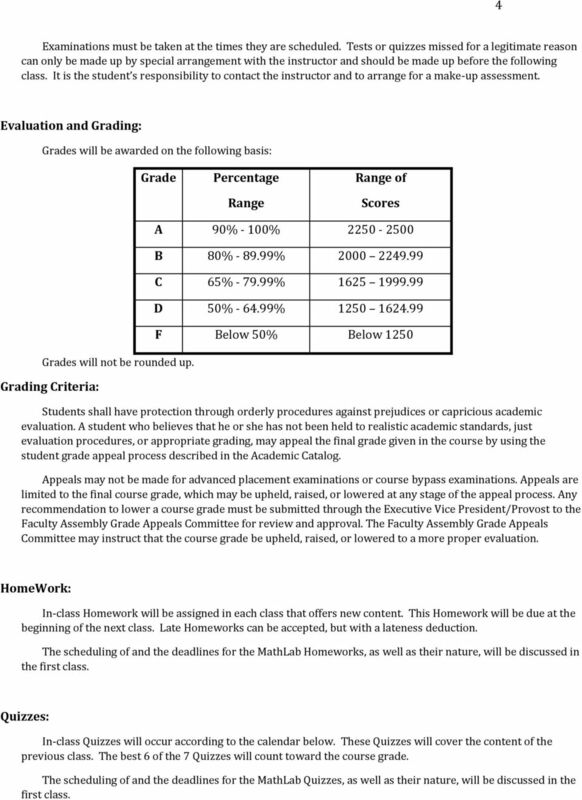 Any recommendation to lower a course grade must be submitted through the Executive Vice President/Provost to the Faculty Assembly Grade Appeals Committee for review and approval. The Faculty Assembly Grade Appeals Committee may instruct that the course grade be upheld, raised, or lowered to a more proper evaluation. HomeWork: In-class Homework will be assigned in each class that offers new content. This Homework will be due at the beginning of the next class. Late Homeworks can be accepted, but with a lateness deduction. 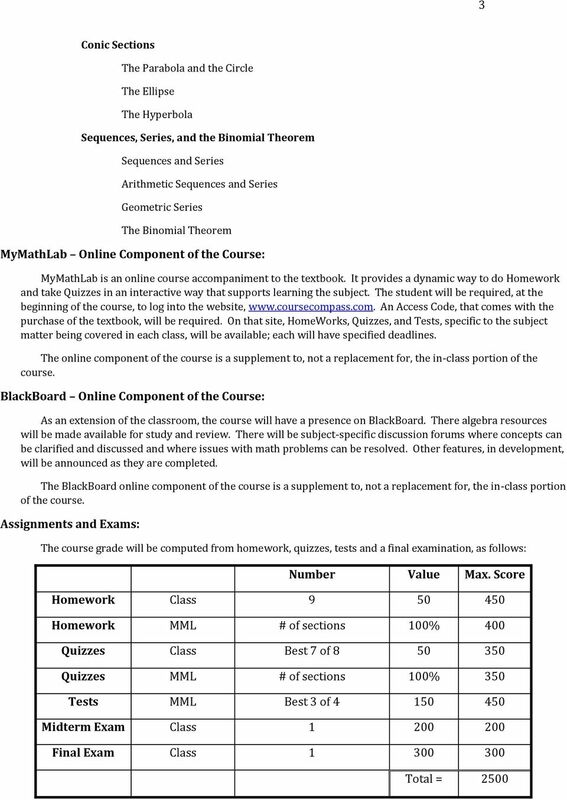 The scheduling of and the deadlines for the MathLab Homeworks, as well as their nature, will be discussed in the first class. Quizzes: In-class Quizzes will occur according to the calendar below. These Quizzes will cover the content of the previous class. The best 6 of the 7 Quizzes will count toward the course grade. The scheduling of and the deadlines for the MathLab Quizzes, as well as their nature, will be discussed in the first class. 5 5 MML Tests: The scheduling of and the deadlines for the MathLab Tests, as well as their nature, will be discussed in the first class. The best 3 out of 4 will be counted toward the final Grade. The scheduling of and the deadlines for the MathLab Tests, as well as their nature, will be discussed in the first class. Midterm and Final Exam: The Midterm Exam will cover the material from the first half of the course. 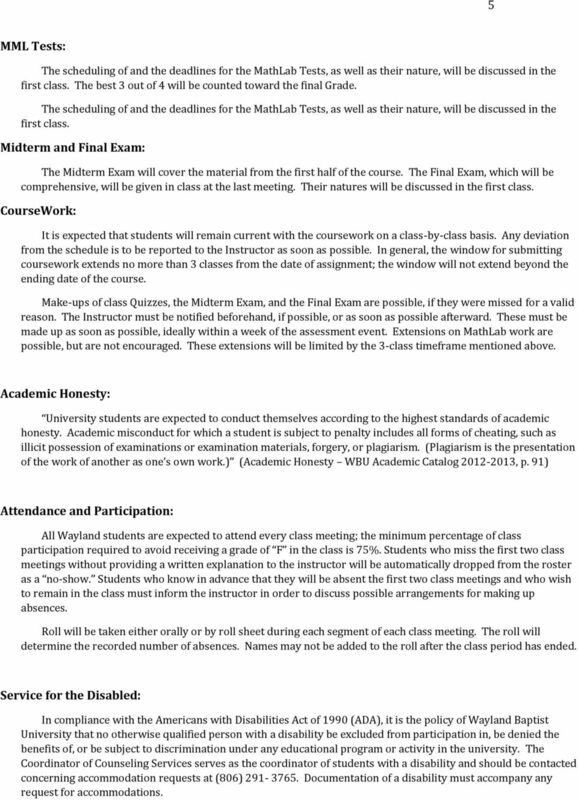 The Final Exam, which will be comprehensive, will be given in class at the last meeting. Their natures will be discussed in the first class. CourseWork: It is expected that students will remain current with the coursework on a class-by-class basis. Any deviation from the schedule is to be reported to the Instructor as soon as possible. In general, the window for submitting coursework extends no more than 3 classes from the date of assignment; the window will not extend beyond the ending date of the course. Make-ups of class Quizzes, the Midterm Exam, and the Final Exam are possible, if they were missed for a valid reason. The Instructor must be notified beforehand, if possible, or as soon as possible afterward. These must be made up as soon as possible, ideally within a week of the assessment event. Extensions on MathLab work are possible, but are not encouraged. These extensions will be limited by the 3-class timeframe mentioned above. Academic Honesty: University students are expected to conduct themselves according to the highest standards of academic honesty. Academic misconduct for which a student is subject to penalty includes all forms of cheating, such as illicit possession of examinations or examination materials, forgery, or plagiarism. (Plagiarism is the presentation of the work of another as one s own work.) (Academic Honesty WBU Academic Catalog , p. 91) Attendance and Participation: All Wayland students are expected to attend every class meeting; the minimum percentage of class participation required to avoid receiving a grade of F in the class is 75%. Students who miss the first two class meetings without providing a written explanation to the instructor will be automatically dropped from the roster as a no-show. Students who know in advance that they will be absent the first two class meetings and who wish to remain in the class must inform the instructor in order to discuss possible arrangements for making up absences. Roll will be taken either orally or by roll sheet during each segment of each class meeting. The roll will determine the recorded number of absences. Names may not be added to the roll after the class period has ended. Service for the Disabled: In compliance with the Americans with Disabilities Act of 1990 (ADA), it is the policy of Wayland Baptist University that no otherwise qualified person with a disability be excluded from participation in, be denied the benefits of, or be subject to discrimination under any educational program or activity in the university. The Coordinator of Counseling Services serves as the coordinator of students with a disability and should be contacted concerning accommodation requests at (806) Documentation of a disability must accompany any request for accommodations. 6 6 End of Course: The grade of I (Incomplete) will be given only in circumstances of unusual need, when it is not reasonably possible for the student to complete all course requirements by the last day of class. 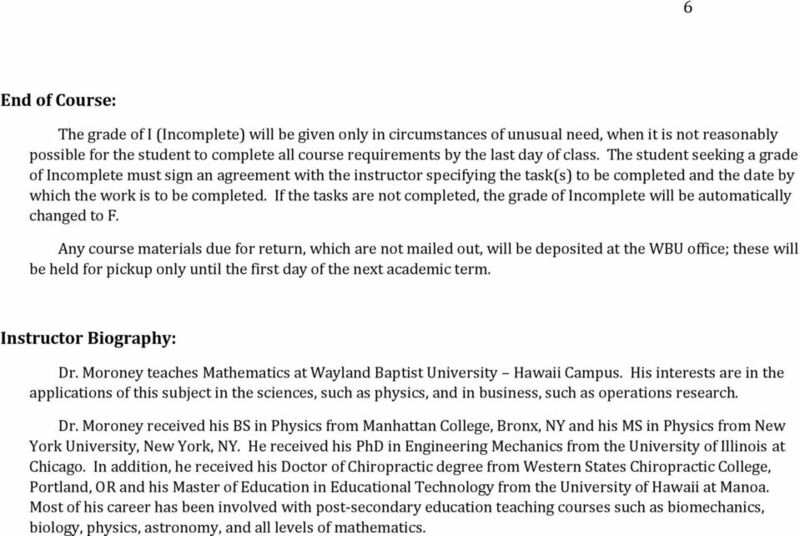 The student seeking a grade of Incomplete must sign an agreement with the instructor specifying the task(s) to be completed and the date by which the work is to be completed. If the tasks are not completed, the grade of Incomplete will be automatically changed to F. Any course materials due for return, which are not mailed out, will be deposited at the WBU office; these will be held for pickup only until the first day of the next academic term. Instructor Biography: Dr. Moroney teaches Mathematics at Wayland Baptist University Hawaii Campus. His interests are in the applications of this subject in the sciences, such as physics, and in business, such as operations research. Dr. Moroney received his BS in Physics from Manhattan College, Bronx, NY and his MS in Physics from New York University, New York, NY. He received his PhD in Engineering Mechanics from the University of Illinois at Chicago. In addition, he received his Doctor of Chiropractic degree from Western States Chiropractic College, Portland, OR and his Master of Education in Educational Technology from the University of Hawaii at Manoa. Most of his career has been involved with post-secondary education teaching courses such as biomechanics, biology, physics, astronomy, and all levels of mathematics. 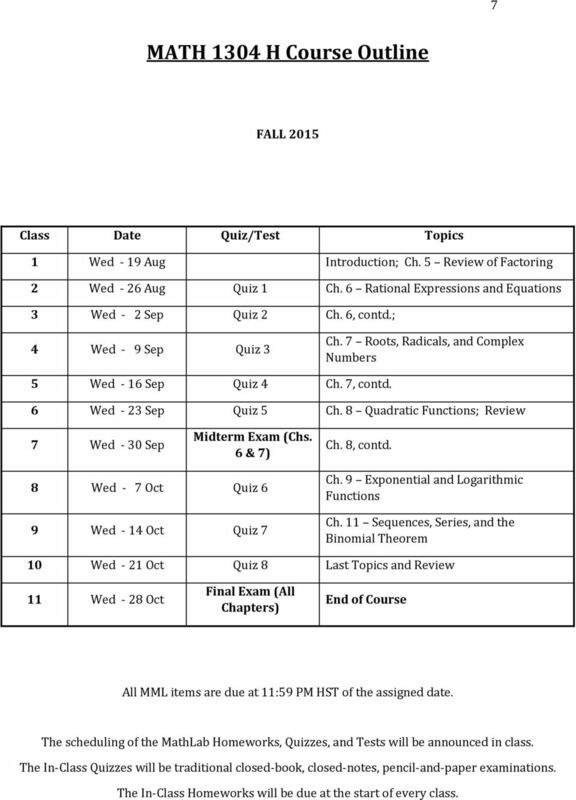 7 7 MATH 1304 H Course Outline FALL 2015 Class Date Quiz/Test Topics 1 Wed - 19 Aug Introduction; Ch. 5 Review of Factoring 2 Wed - 26 Aug Quiz 1 Ch. 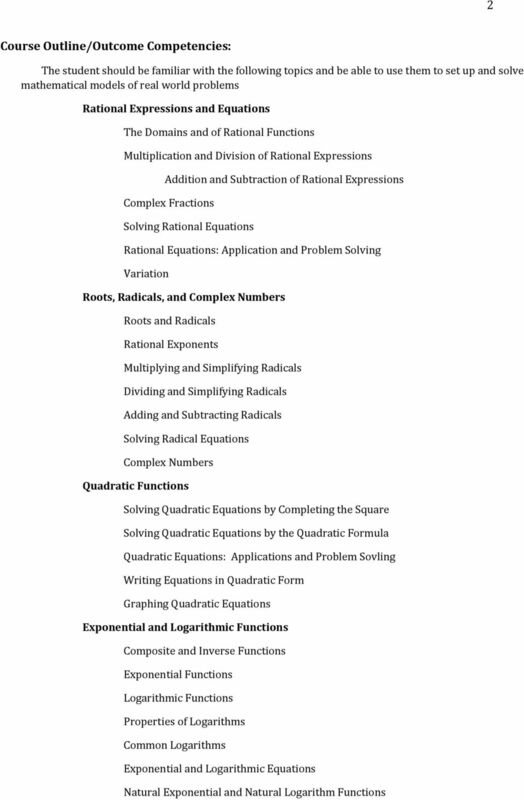 6 Rational Expressions and Equations 3 Wed - 2 Sep Quiz 2 Ch. 6, contd. ; 4 Wed - 9 Sep Quiz 3 Ch. 7 Roots, Radicals, and Complex Numbers 5 Wed - 16 Sep Quiz 4 Ch. 7, contd. 6 Wed - 23 Sep Quiz 5 Ch. 8 Quadratic Functions; Review 7 Wed - 30 Sep Midterm Exam (Chs. 6 & 7) Ch. 8, contd. 8 Wed - 7 Oct Quiz 6 9 Wed - 14 Oct Quiz 7 Ch. 9 Exponential and Logarithmic Functions Ch. 11 Sequences, Series, and the Binomial Theorem 10 Wed - 21 Oct Quiz 8 Last Topics and Review 11 Wed - 28 Oct Final Exam (All Chapters) End of Course All MML items are due at 11:59 PM HST of the assigned date. The scheduling of the MathLab Homeworks, Quizzes, and Tests will be announced in class. The In-Class Quizzes will be traditional closed-book, closed-notes, pencil-and-paper examinations. The In-Class Homeworks will be due at the start of every class.